Time Tracking | Tennessee Aircraft Services, Inc.
One of the first items on our annual inspection checklist is to confirm the total times and time since overhaul of the airframe, engine and propellers. Seems a simple enough effort; just check the recorder time and compare it to the numbers obtained at the last annual. We’ve discovered the likelihood of a 40+ year old 182 having correct times documented is about 50/50 odds. Keeping this time accounting up to date isn’t even the mechanic’s job. It’s the registered owner’s or operator’s responsibility. 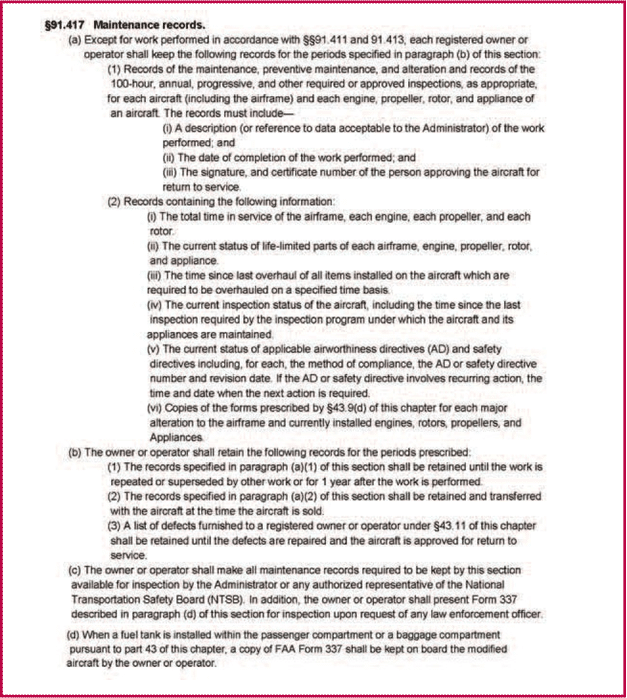 FAA CFR 91.417(a)(2)(i) clearly states the owner/operator must maintain records showing total time in service of the airframe, engine, and propeller. This isn’t news to most owners, but the question is whether the owner has made an effort to ensure the numbers are correct. FAA CFR 91.417(a)(2)(ii) requires records of all life limited parts be maintained. This isn’t usually a problem for legacy Cessna owners as none of these planes came from the factory with any life limited parts. The question would be if anything has been added to the plane in the form of a major alteration under an FAA Field Approval or Supplemental Type Certificate (STC) that does have a life limited part. FAA CFR 91.417(a)(2)(iii) requires keeping tabs on times since overhaul on those parts of the plane that require overhaul at specified intervals. The legacy high wing Cessnas have no required overhaul time limits, but the newer planes certified under CFR Part 23 do. The Columbia/Corvalis/300/350/400/TTX/T240 all have parts, called out in their Maintenance Manual chapter 4 for FAA Airworthiness Limitations, that have required overhaul times. FAA CFR 91.417(b)(2) not only requires these time records be maintained but that they are passed on with the aircraft when it is sold. An important point during a prepurchase evaluation for sure. None of this is particularly difficult but does require some due diligence on the part of the owner/operator. The older the plane, the more effort is required, and even a certain amount of investigative work may be called for to audit and maintain these numbers. The regulations don’t state how the operational time is to be monitored, so the historical records may not be as straightforward as one would hope. For single engine planes there is usually a recording tachometer. The old school tachometer “measures” time pretty inconsistently due to the mechanical limitations of its design relying on centrifugal forces. It’s only accurate at one RPM which is about 2400. Tachometers record time based on the RPM of the engine, so time records slow at idle and too fast at maximum 2700 RPM. The normal aging process causes these old instruments to read about 5% low after a few years and should be checked against some sort of standard from time to time. The electronic revolution has generated several digital versions of the tachometer. Most of these use some method of “counting” revolutions over time, which is almost always more precise than measuring revolutions as does the mechanical tach. One might count the pulses on the magneto Pleads or use a “hall effect sensor” to count the revolutions of the spinning magnet in the magneto. The resulting pulses are basic “ones” and “zeros” that a simple electronic circuit easily converts to an RPM display. When this electronic tachometer starts and stops recording flight time is dependent on its circuitry and what the FAA allowed during certification. Industry uses the generic term “Hobbs” meter to describe most any time recorder that is activated by some electric switch. There are several different switching devices used to activate an hour meter depending on the aircraft and application. Regardless of the activation method, the hour meter runs at standard clock rate anytime it’s turned on. The typical factory installed hour meter is activated by an engine oil pressure switch. Anytime the engine oil pressure exceeds a predetermined threshold, electric power is applied to the hour meter to activate it. Some aircraft will have a small “flapper” in the slipstream of the aircraft that engages a switch once the aircraft exceeds a certain airspeed. Others may use a pressure switch attached to the pitot line to detect airspeed. Still others might just be wired to turn on anytime the avionics buss is powered. A simple clock or one’s wrist watch can also be used to track flight time. It requires the most effort on the operator’s’ part as the time must be manually logged somewhere and that log maintained. We see this a lot in records for aircraft coming from Canada. This manual method would never work for me as I’d rarely think to note departure time or arrival times. I don’t know how you Canadians do it, but you are obviously more disciplined than I. Often a plane will have a tachometer and an hour meter. The mechanical recording tachometer runs about 5% to 10% slower than a Hobbs meter. This is a very useful difference when a plane is used for rental. The tachometer can be used for tracking maintenance events while the Hobbs meter tracks rental times. This may sound a little devious to some, but it’s a perfectly normal and acceptable process. There are real challenges in reading through forty plus years of log entries to track aircraft times. To do it correctly requires one to start with the first maintenance entry and read through each entry. Any change in continuity of the times should be noted for posterity sake. There are many opportunities for error in documenting the total times and overhaul times for your aircraft. Any accountant could imagine the sorts of issues typical of mostly hand written records spanning forty years. We noted a few for ourselves. Even differences in the writing styles of many mechanics create difficulties. A six looks like an eight, a five looks like a six, a two looks like a seven and others. Some will follow tach readings, then the next mechanic may follow Hobbs reading. This may create a subtle but significant change in the total time. It will be complicated by the next mechanic that reverts back to the tachometer but uses the previous mechanic’s errored total time calculation based on the Hobbs reading. Math errors and transposed digits are another set of problems that must be checked on every entry. The most likely time for errors is related to the installation of a “new” time recorder. Most of the time a new recorder will start at zero hours, but often a serviceable used recorder is installed with some other starting number. Simple math suddenly becomes complicated. If you should choose to take the time to audit your maintenance records and discover or confirm the total time, it seems equally prudent to thoroughly document your findings. An entry in the log books recording the discontinuities by date and events will help ensure proper times going forward. I might also suggest starting any new log book with the same sort of comprehensive time tracking entry. I’ve never seen this done before, so you could be the first to shock and amaze your mechanic along with everyone that will read that entry from now on.